View More In Canister Vacuums. The Hoover CH85005 ground command HEPA commercial backpack vacuum is an exceptional option for professional cleaners. This vacuum makes cleaning easier than ever and offers multiple amenities that will save time and increase productivity. The Hoover CH85005 ground command HEPA commercial backpack vacuum includes a 6 piece tool kit that provide extensive cleaning options. Not only do these tools eliminate the need for frequent bending, but they aid in quick cleanups in a time efficient manner. The Hoover CH85005 ground command HEPA commercial backpack vacuum includes a 50' power cord for increased mobility. This vacuum won't hinder the operator, providing freedom of movement and reaching vast distances. 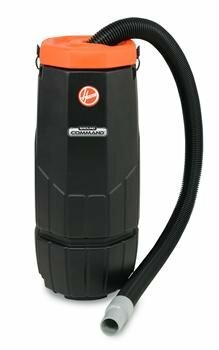 This vacuum includes a user friendly hose that screws into the backpack securely and permits left or right handed use. This feature allows the operator to customize the vacuum for personal use and makes cleaning a comfortable experience. The Hoover CH85005 ground command HEPA commercial backpack vacuum comes equipped with an interchangeable lid that converts this vacuum into a blower. This option eliminates the need to supply additional equipment, thus proving to be a cost-effective feature. If you have any questions about this product by Hoover Commercial, contact us by completing and submitting the form below. If you are looking for a specif part number, please include it with your message.